Armstrong Marine Service Inc. first opened it's doors for business on Jan. 1, 1995. The business is owned and operated by Ron and Sherry Armstrong of Troutman, NC. Both Ron and Sherry were born and raised in the Lake Norman area. Ron is a natural mechanic and has been working on boats for over 30 years. He worked for several local dealerships before making the decision to go out on his own. Sherry has a Bachelor's degree in Business Management, and so after much prayer and planning, we combined our specialties and the business was "born" in a small, rented, two-bay shop on State Park Road in Troutman. God blessed the business and we quickly outgrew the original building on State Park Rd. In 2003, we bought the buildings and property which now house our business at 477 Lytton Street in Troutman. We are located just one block off of Main Street (Hwy. 21) in Troutman, NC. Come and visit our shop at 477 Lytton St....just look for the place with lots of boats! Do you need a new boat cover or boat seats re-upholstered? 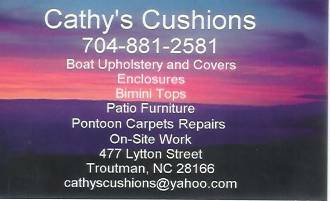 "Cathy's Cushions" is located beside Armstrong Marine Service, and can provide all your canvas and re-upholstery needs. Copyright 2012 Armstrong Marine Service. All rights reserved.